What Should you Look for in a Garage Heater? Choosing a garage heater can be a tricky job. While some heaters may appear cheap, you’ll find out that some may not be suitable for the job once you get them home. Understanding your own requirements will help you pick the right heater for you. Equally, getting to grips with garage heater specifications will educate you on how to make the ideal choice to ensure high energy efficiency and the most perfect temperature in your garage. Here are some things to think about. When looking for a garage heater, the first thing you need to consider is the space you have. If you value floor space, you may want to consider a mounted garage heater. Most often, these are attached to the ceiling but there are others that mount on the wall. Alternatively, if you have the floor space, an unmounted or portable garage heater enables you to position it to your preferred place. There are three main types of heaters that heat the space in different ways. Forced-air heaters cycle blasts off hot air into the space and can be powered by either gas or electricity.The natural gas-powered versions tend to cost more and often need professional installation. Radiant heaters supply a steady warmth to the garage by using reflective panels that direct infrared heat. 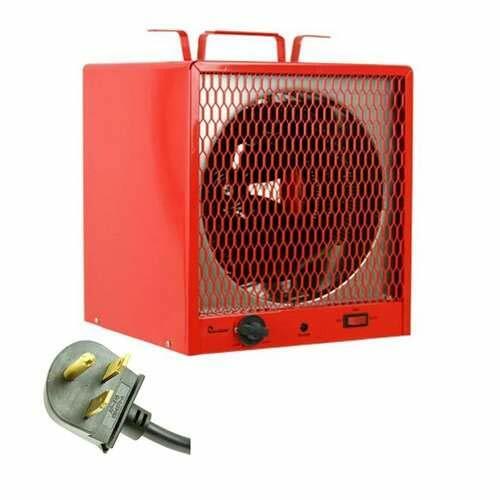 The most affordable variation of garage heater is the one that uses an enclosed heating element or flame to allow the air to rise without a fan. Depending on your energy supply, you will need to consider the fuel used in your heater. Most are powered by natural gas, electricity, or propane, yet some use diesel or kerosene. Equally, the size and capacity of your heater will be dependent on the size of the garage you are trying to warm. Either look for the BTU (British Thermal Units) or for the directions that indicate the size space each heater can cope with. In order to understand the power needed to heat your garage space, you first must understand a few key terms. When referring to electric heaters, the wattage will give you an indication of how much space it can heat. The general rule of thumb is that you need 10 watts per square feet of space. Heaters range in wattage, but you’ll find that newer models come with up to 5600 watts of power. For other types of heaters, look for the BTU. This scale measures each BTU as how much energy it takes to heat one pound of water. In general, 1 watt is equivalent to 3.41 BTU, meaning you need at least 34.1 BTU to heat a square feet. It is important to also consider the temperature and insulation present in your environment. Very cold environments will need far more power to heat. The three most common fuel types used in garage heaters are gas, electricity and propane. Natural gas heaters are economical but you will need gas tubes installed in your home. However, gas heaters are often a little more expensive upfront and sometimes need to be installed by a professional. The problem with natural gas heaters is that you will need to install ventilation to prevent poisoning from any toxic carbon monoxide that may be left behind. Electric heaters usually direct infrared heat. They often come complete with an automatic shut-off when a certain temperature is reached. Although these are not the greatest heaters for large spaces, electric heaters work well in small to medium spaces and provide a direct heating source. Propane heaters are very efficient and economical heaters that warm a space quickly. 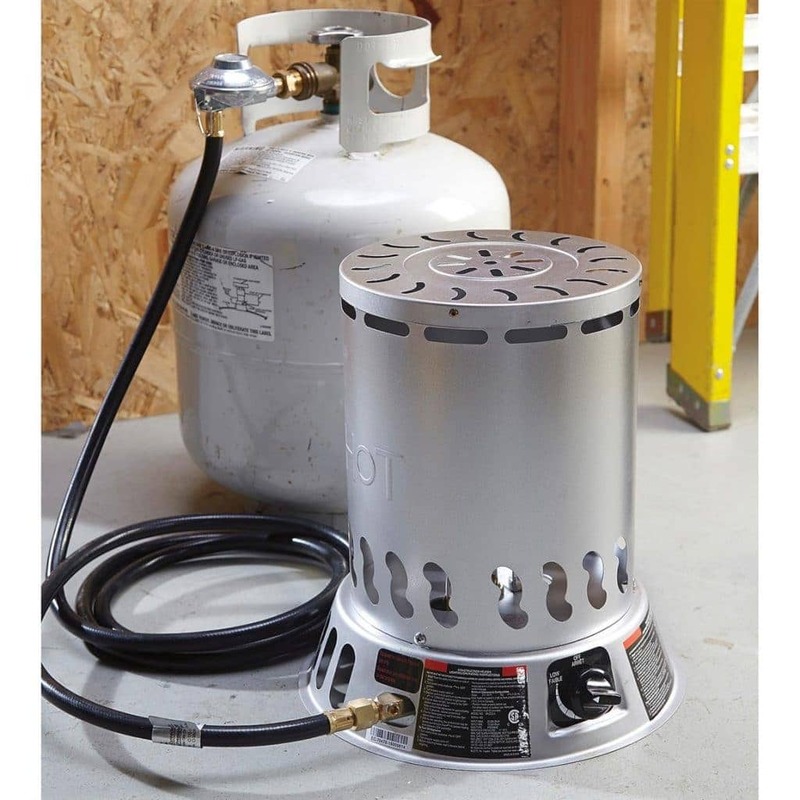 They are great for warming large spaces and propane tanks are generally readily available. You need to be careful with them, though, as they can become dangerous if enclosed. Equally imperative is to ensure you turn the gas tank off after each use , to prevent potentially lethal gas leaks. In general, gas garage heaters are more efficient than those powered by electricity. Gas heaters use less energy to make the temperature rise as much , meaning that they are more economical. Moreover, gas heaters have greater capacity, that is why they heat much larger spaces more consistently and more quickly. Despite this, there are some financial implications you need to consider. For a natural gas-powered heater, you need to have gas tubes installed in your house. If you need this installation, it will cost you money. This could make gas-powered heaters a less efficient choice for you. Equally, gas-powered heaters tend to cost more and often need professional installation, which again raises the costs. Electric garage heaters are generally far cheaper to purchase and do not need any professional installation. Despite this, running these types of garage heaters is far more expensive . On average, running an electric-powered heater costs 20% more than running a gas-powered heater. Furthermore, heaters that run on electricity tend not to be able to heat large spaces as consistently or quickly as gas. They are great for direct heat and for warming a small space, but in terms of heating large spaces, they are definitely far more inefficient than gas. Finding the best garage heater relies on your preferences. Consider the size of the space you would like to heat, your source of fuel, and your living situation before choosing a heater. With those points in mind, the following heaters are some of the best on the market. This model is an electric heater that comes complete with built-in vertical and horizontal mounting brackets. The louvers are adjustable to direct heat and the temperature can range from 45F to 135F. It weighs 24 pounds and produces 5000 watts of power. The adjustable louvers enable easy directing of heat. The mounting brackets allow a versatile and easy installation. This model is highly durable as it was originally designed for industrial use. For an electric heater, it is extremely efficient; using it costs around $1 an hour . It is loud and some users have complained about a rattling sound. This heater is far heavier when compared to other heaters, meaning it needs to be securely attached to the ceiling. Surprisingly efficient, this heater is suitable for spaces around 500 square t feet in size. This model only works for garages with solid ceilings due to its heavy weight, yet its temperature range and adjustable heat direction make it a versatile heating unit. 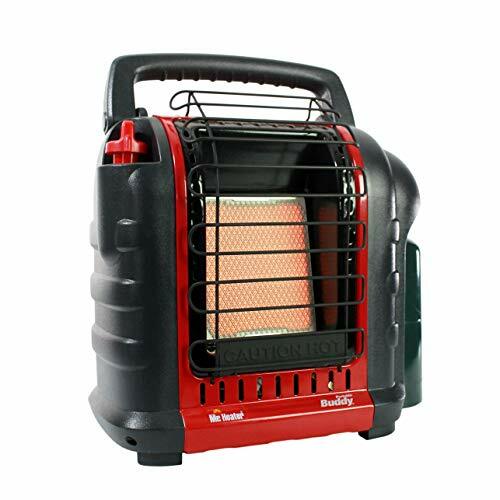 This model is a portable propane infrared heater. It features two heat settings and a large porcelain-coated heating surface for thermal mass radiation heating. It comes with a safety shut-off and a swivel-out regulator to connect to a propane tank. It can heat up to 900 square t feet on the highest setting. The fold-down handle makes it easily portable and easy to store. The shut-off setting makes it a far safer heater, preventing it from overheating and exploding. The porcelain-coated heater increases energy efficiency by reflecting the heat further outwards. There are only two heat settings, which decreases temperature versatility. Customers have complained that the company has awful customer service. This model is able to heat large spaces and features safety mechanisms to decrease any danger associated with propane fuel. Though easily portable, it only features two heat settings, which do not allow for much variance in heat. Overall, it has been rated as a great product, but if there were to be an issue, the customer service is said not to be reliable. This electric-powered heater provides heat through a quartz heating element and features a 25 watt halogen bulb as a powerful light source. 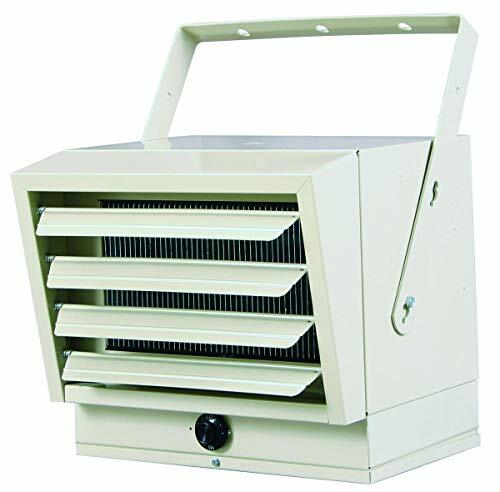 With 1500 watts of power, this model can heat around 150-200 square feet. It has a moveable bracket, allowing a 90 degree tilt and weighs only 7.45 pounds. It is very light so it can be attached to most ceilings. The bracket can tilt to redirect heat and light to where it is most needed. The quartz heating element is highly efficient , which makes it very cheap to run. 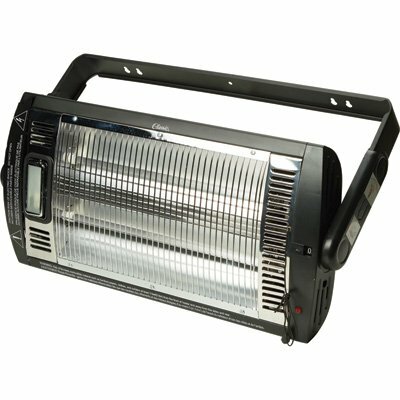 It combines a heat source with a bright halogen light, making it a great addition to any workshop or garage. This heater is limited to only being able to heat small spaces. The power cord is only 6 feet long, which limits where it can be placed. This product is most suitable for smaller spaces or for users looking for direct heat. The light makes it great for a workshop and the adjustability increases its versatility. Featuring 5 heat settings and 30,000 watts of power, this heater can warm up to 3000 square feet of space and provides a versatile temperature range from 60F to 118F. It comes with both wall mounting hardware and legs for floor standing and has an automatic low-oxygen shut-off feature as a safety mechanism. 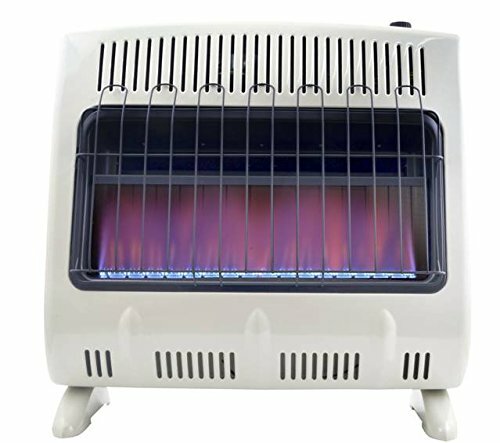 This heater is perfect for heating large spaces. This model includes a thermostat to automatically regulate the temperature. It can be mounted on the wall or it can stand on itself , increasing portability. It has a safety mechanism to prevent toxic carbon monoxide from being formed. If used above 4,500 feet of elevation, it may shut off. This model is quite heavy and therefore needs a strong wall or ceiling to hold on to . If you’re heating big spaces at low altitudes, this is a great model to choose. Be aware that you need a strong ceiling if you want to mount it , otherwise it can be used as a portable, standalone device. This electric heater can heat up to 600 square feet with a temperature range of 45-95F. It features a thermostat for temperature regulation and an automatic shut-off to prevent it from overheating. It stands on the floor and has a fold down handle for portability. It is extremely quiet for an electric heater. It can heat a large area despite being powered by electricity. The model is relatively small, making it easily portable and storable. It needs a 6-30R plug to function. It doesn’t reach as high temperatures as other models. Overall, this is a great little heater to warm up a relatively large space. It’s self-regulating and comes with a safety feature. It isn’t suitable for people wanting to mount their garage heaters. Choosing the right garage heater can considerably increase the enjoyment of working in this space. However, it is important to understand your own requirements before making an impulse purchase. While some heaters may appear cheap from the outset, they won’t always be as energy efficient as you would expect and may not be able to heat the all garage. Consider the space first, then pick a garage heater that will do the job in the most effective way.